Although a variety of mouth ulcers may recur, for example those associated with mechanical trauma and skin disease; there is a group of ulcers that arise due to unknown causes whose natural history is characterized by frequent recurrences over a number of years. It is to this group that the collective term recurrent aphthous stomatitis (RAS) is applied. 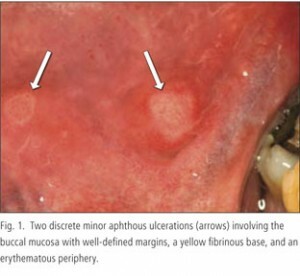 Injury to the oral mucosa, from whatever cause, may result in a localized defect of the surface in which the covering epithelium is destroyed, leaving an inflamed area of exposed connective tissues. Such defects are called oral ulcers. What is recurrent aphthous stomatitis (RAS)? Recurrent aphthous stomatitis, also known as aphthae, aphthous ulcer or canker sores affects at least 10% of the population. There is a slight female predisposition to recurrent aphthous stomatitis and it typically starts in childhood or adolescence. There are three types of aphthous ulcers that are recognized, based primarily on their clinical features: minor aphthous ulcers, major aphthous ulcers, and herpetiform ulcers. In addition, any of the three types may be associated with Behçet’s disease. What are the predisposing factors of recurrent aphthous stomatitis? Emotional stress and other psychological factors – ulcers seem to aggravate during school or university examination times. Blood and deficiency disorders – in up to 20& of individuals with recurrent aphthous stomatitis, iron, folic acid (folate) or vitamin B deficiency is found. Hormonal disturbances – endocrine factors are relevant in some women who relates ulcers to the menstrual cycle or to an oral contraceptive. Cessation of smoking – cessation may precipitate or worsen recurrent aphthous stomatitis in some cases but the reason is unclear. Symptoms before the onset of attack are described as soreness, burning or prickling sensations are recognized by many individuals 1 to 2 days before the onset of ulceration. The mucosa or soft tissues may appear normal at this stage. Minor aphthous ulceration accounts for 80% or more cases of recurrent aphthous stomatitis. Occurs mainly in the 10 to 40 years age group, minor aphthous ulcers often causes minimal symptoms. The condition is characterized by the occurrence of from one to five, shallow, round or oval ulcers which affect the non-keratinized areas of oral mucosa such as the lips, cheeks and floor of the mouth. The ulcers are less than 10mm in diameter and have a grey or yellow base with a red halo margin. They heal without scarring, usually within about 7 to 10 days and they tend to recur at one to four months intervals, although this is variable. Major aphthous ulcers are larger than minor aphthae, round or ovoid in shape and are usually greater than 10mm in diameter. They may occur anywhere in the mouth, including the keratinized oral mucosa but the lips, soft palate, tonsillar areas and oropharynx are common sites. The number of ulcers varies from one to ten and they may take 4 to 6 weeks to heal, and may heal with scarring. They tend to recur at less than monthly intervals, so that in severe cases of ulceration of the oral cavity is virtually continuous and may be associated with severe discomfort and with difficulty in eating and speaking. Unlike the shallow ulceration of minor aphthae, major aphthae extend deeper and may present as crater-like ulcers with rolled margins which are indurated on palpation because of underlying fibrosis. Differentiation of an isolated lesion from an oral cancer ulcer may be difficult. Herpetiform ulceration are found mainly in females and is characterized by multiple, small, pin-head sized ulcers about 1 to 2mm across that can occur on any part of the oral mucosa. As many as a hundred ulcers may be present. When several ulcers are clustered together, confluence can result in larger areas of ulceration of irregular outline. The ulcers usually heal within 2 to 3 weeks. Large confluent ulcers may take linger and may heal with scarring, but this is not otherwise prominent. The ulcers tend to recur at less than monthly intervals and as for major aphthae may be associated with severe discomfort. It is the least common type of ulceration associated with recurrent aphthous stomatitis and tends to occur in an elder age group compared to minor and major aphthae. Herpetiform ulcers resemble viral ulcers but are not preceded by vesicles or blistering.